The problem with experiencing a year of explosive market growth is that it can make subsequent years look soft -- which is part of what happened to the U.S. solar market in 2017. The story doesn’t end there, though. 2017 wasn’t just a year of tempered growth for the U.S. solar industry -- it also exposed weaknesses in certain market segments and specific locations, and marked successes in others. Most notably, the residential and utility-scale segments both saw installations fall on an annual basis for the first time since GTM Research and SEIA began publishing the Solar Market Insight report in 2010. The performance of residential solar was most surprising. Despite a relatively stable policy environment, and solar having reached grid parity in half of all U.S. states, residential solar installations fell by 16 percent on an annual basis for a total of 2,227 megawatts deployed in 2017. SEIA and GTM Research first chronicled the residential solar slowdown in California last spring, which was attributed to a wet winter and saturation in the state’s largest solar market. Over the remainder of the year, the phenomenon of customer-acquisition challenges had spread to other established solar markets, including Massachusetts, Nevada and Hawaii. “The main story for residential solar is that across all major markets we saw a significant slowdown,” said Austin Perea, solar analyst at GTM Research and lead author of the report. 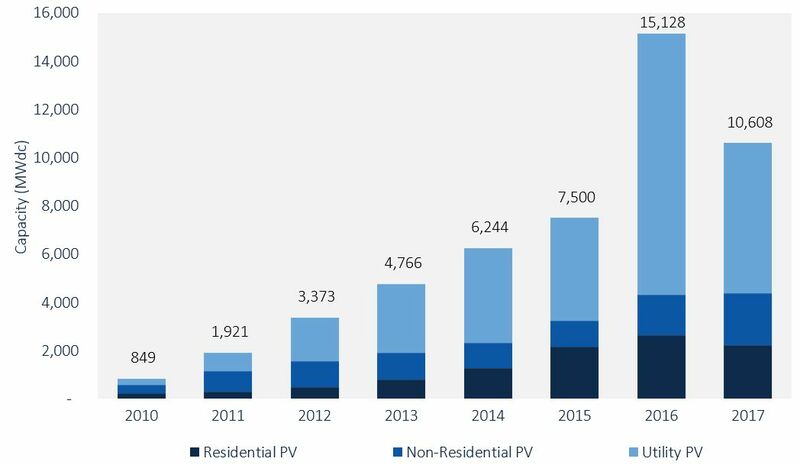 Of the top 10 residential solar markets in 2016 -- which collectively accounted for 85 percent of installed residential capacity that year -- only two saw annual growth in 2017. California and all major Northeast markets experienced annual contractions. Arizona and Utah both experienced growth last year, but it was driven by policy-related factors. 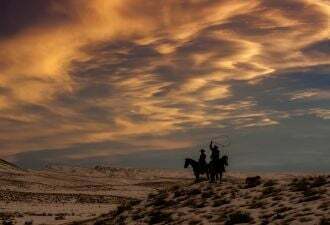 Utah saw a rush of applications ahead of the cutoff date for Rocky Mountain Power’s more generous net metering program, which ended in November. Arizona saw a similar installation increase last year as customers sought to take advantage of retail-rate net metering credits in Arizona Public Service territory before new, less favorable rates took effect. According to Perea, Arizona’s residential solar market would likely have been flat or even declined last year without the policy change incentive. In general, markets with greater solar penetration are experiencing heightened customer-acquisition issues as the pool of attractive early-adopter customers grows increasingly thin and companies seek to mainstream their offerings. “While the relationship between market penetration and growth does not fully explain the market downturn, GTM Research believes it is becoming a more significant factor in constraining growth amongst major state markets," the report states. Net metering reform and the loss of state incentives also play a role. 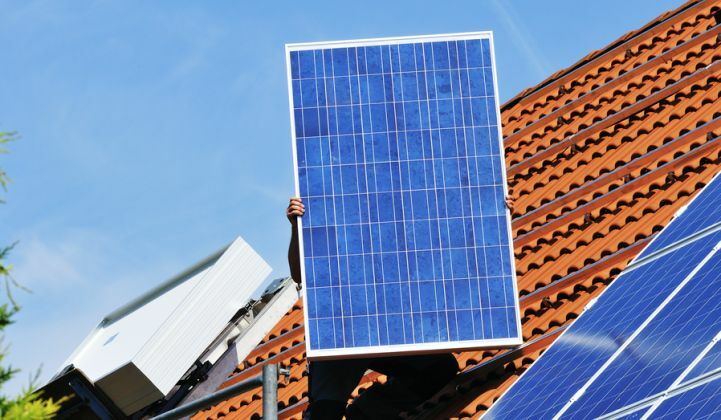 Business-model shifts among the major solar installers are another relevant factor. SolarCity, Vivint and Sunrun have had difficulty scaling up their new loan and customer-owned solar products, said Perea. SolarCity, once the nation’s leading residential solar installer, has had a particularly difficult time following its acquisition by Tesla. Sunrun likely surpassed SolarCity as the leading residential solar installer across all deal types (including leases, PPAs, loans and cash sales) in the third quarter of 2017. SolarCity saw significant declines across major markets over the past year. In Massachusetts, the company’s installation volumes dropped 75 percent. But Perea underscored that the slowdown can’t be blamed entirely on Tesla’s solar business. Customer-acquisition costs are a persistent issue for the residential solar sector. While system components and even labor costs are declining, customer-acquisition costs are actually rising. Permitting is another issue that the U.S. market should be paying attention to, said Perea. Countries like Australia have streamlined the rooftop solar permitting process, which lowers overall system costs. It follows logically that a lower-cost system is easier to sell, which should reduce customer-acquisition costs, for a compounding positive effect. “I'm of the opinion that there is a lot we could do on the permitting side to streamline and make the overall permitting process a lot less onerous for residential installers,” Perea said. As the industry looks for new ways to cut costs, Dan Whitten, vice president of communications at SEIA, pointed out that residential solar is also being coupled with other technologies to add more value. “I think some of the innovations in residential solar, with storage and opportunities to electrify the entire household, are going to put wind in the sails there,” he said, in an interview. It’s also the case that installers in second- and third-tier solar states are making a lot of progress, he said. According to the latest Solar Market Insight report, 25 of the 44 states tracked saw year-over-year growth in annual residential PV installations. Unlike residential solar, the year-over-year downturn for the utility-scale segment was largely expected, due to the flood of installations seen in 2016 ahead of the anticipated expiration of the 30 percent federal Investment Tax Credit, the report states. The credit was ultimately extended through 2019 and is set to decline over time. However, last year’s slowdown was also triggered by certain policy shifts. Uncertainty surrounding the Section 201 tariffs on solar cells and modules caused many utility-scale projects to be shelved last year. The fourth quarter of 2017 saw price increases in most PV market segments, but especially in utility-scale solar, due to a global shortage of Tier 1 module supply and reactions to the trade petition. In addition, the cancellation and delays of solar projects deployed under the Public Utility Regulatory Policies Act (PURPA) resulted in many utility-scale projects spilling over into 2018. These market shifts were offset in part by a strong showing in the non-residential solar market in 2017, which grew 28 percent year-over-year, notching its fourth straight year of annual growth. This year in particular saw an “explosion” in the community solar market, led by Minnesota and Massachusetts -- which collectively accounted for more than 80 percent of community solar last year. Community solar now accounts for nearly 20 percent of non-residential solar PV, with the remainder made up of commercial and industrial projects. Massachusetts and Minnesota are expected to remain strong community solar markets through 2018, thanks to favorable policies. Meanwhile, community solar programs in New York and Maryland are expected to come online and spur growth this year, while Illinois is expected to become a strong community solar market in 2019. “I think it's something that’s going to grow increasingly over time -- it's just too good of an idea not to,” said Whitten. Looking ahead, the U.S. solar market will continue to see growth rates accelerate and slow within different market segments and in various states. However, two federal policies are expected to have the greatest impact. In response to the Section 201 trade case and corporate tax reform passed at the end of last year, GTM Research has reduced its solar PV forecasts by 13 percent from 2018 through 2022 compared to the projections in previous reports. The four-year tariffs will have a cooling effect on the market over the next few years. However, 2018 will be somewhat insulated because many market players procured solar module supplies in advance, and because utilities in states with renewable energy targets are still mandated to purchase solar by law. The impact of the tax bill is less clear. At its core, the law lowers the top corporate tax rate from 35 percent to 21 percent, which, in theory, “could reduce the availability of tax equity financing given that overall corporate tax liability will be lower,” the report states. The Base Erosion Anti-Abuse Tax measure and the option for investors to take 100 percent bonus depreciation could also affect solar financing. However, these changes aren’t expected to have major implications. "We're still assessing the impacts [of the tax bill], but we don't think it's going to be the main factor in any leveling off that's going to happen,” said Whitten. GTM Research is currently expecting flat growth in the U.S. solar market this year, with a total of 10.6 gigawatts deployed in 2018 -- the same as in 2017. 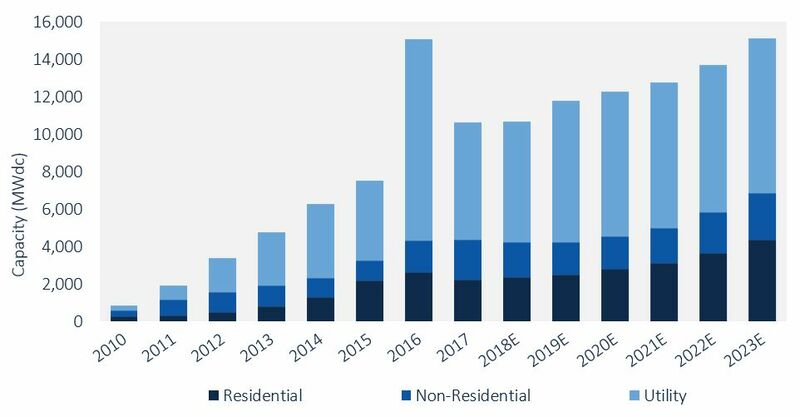 While the near-term forecast is lower than previous GTM Research projections, the total installed U.S. PV capacity is still expected to more than double over the next five years, and by 2023, more than 15 gigawatts of PV capacity will be installed annually. That number could end up being much higher. SEIA projects that there could be up to 23,000 jobs lost in the U.S. solar industry this year, due to a market slowdown caused by import tariffs. But the industry might successfully adjust, and the effects may not be as damaging as expected, said Whitten. Research subscribers can access the full report in their accounts. Not yet a subscriber? Learn more about our U.S. Distributed Solar Service or our U.S. Utility-Scale Solar Service.